Work from Harvey McMahon’s group in the LMB’s Neurobiology Division has uncovered how a protein, FCHSD2, controls actin polymerisation during endocytosis. Importantly the scientists discovered that FCHSD2 does its job from the area surrounding the site of endocytosis – making it the first description of an endocytic protein which localises to the flat region around endocytic events. Endocytosis is the process by which portions of the cell’s plasma membrane bud inwards to make an internal bubble which then pinches off bringing surface receptors, pathogens and nutrients inside the cell. Clathrin mediated endocytosis is the most common type of endocytosis. During this process an actin network, originating from the inner surface of the surrounding membrane, forms and is believed to help propel the budding membrane inwards. 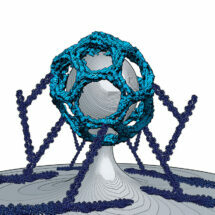 How this actin network is regulated and what molecules are involved in its formation are not fully understood. The BAR protein FCHSD2 provides a mechanism for the formation of the actin network surrounding endocytic events. CC-BY MRC Laboratory of Molecular Biology. Leonardo Almeida-Souza in Harvey’s group, helped by colleagues from across the LMB, combined experiments in cells, biochemical assays, super resolution microscopy and structural approaches, including electron cryo-microscopy and X-ray crystallography, to determine how FCSHD2 does its job. 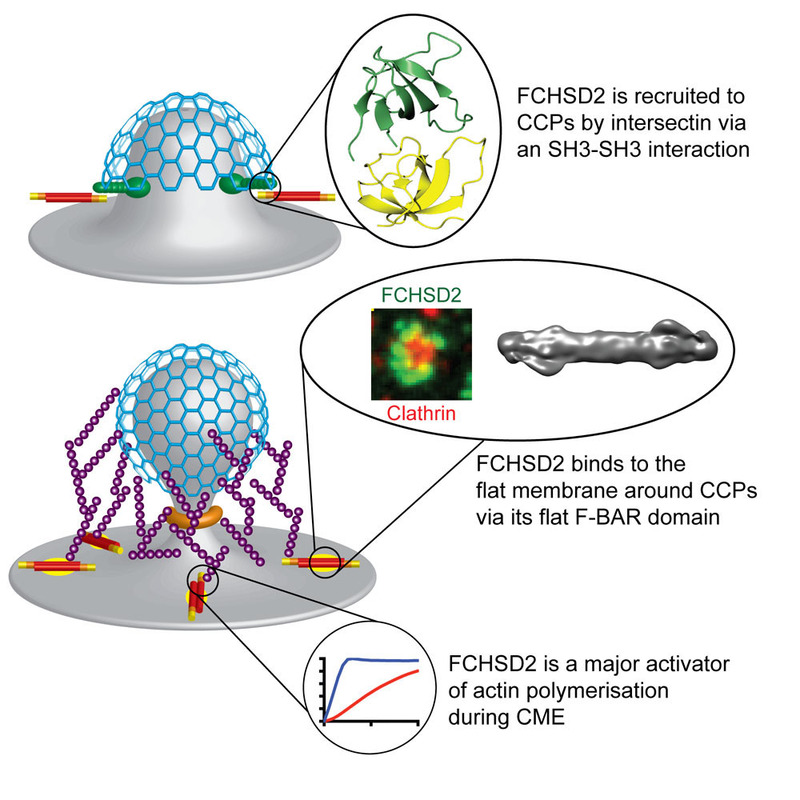 Live-cell imaging showed that FCSHD2 comes to the plasma membrane at mid-to-late stages of endocytic pit formation, and X-ray crystallography combined with studies of mutants revealed how FCHSD2 is recruited to endocytic pits. Biochemical assays were used to unravel the details of how FCSHD2 strongly promotes actin polymerisation in the presence of membranes. Finally, super resolution microscopy revealed that FCSHD2 is found on the flat areas of membrane around endocytic pits and electron cryo-microscopy was used to understand how the substructure of FCSHD2 enables it to localise to these surrounding areas. 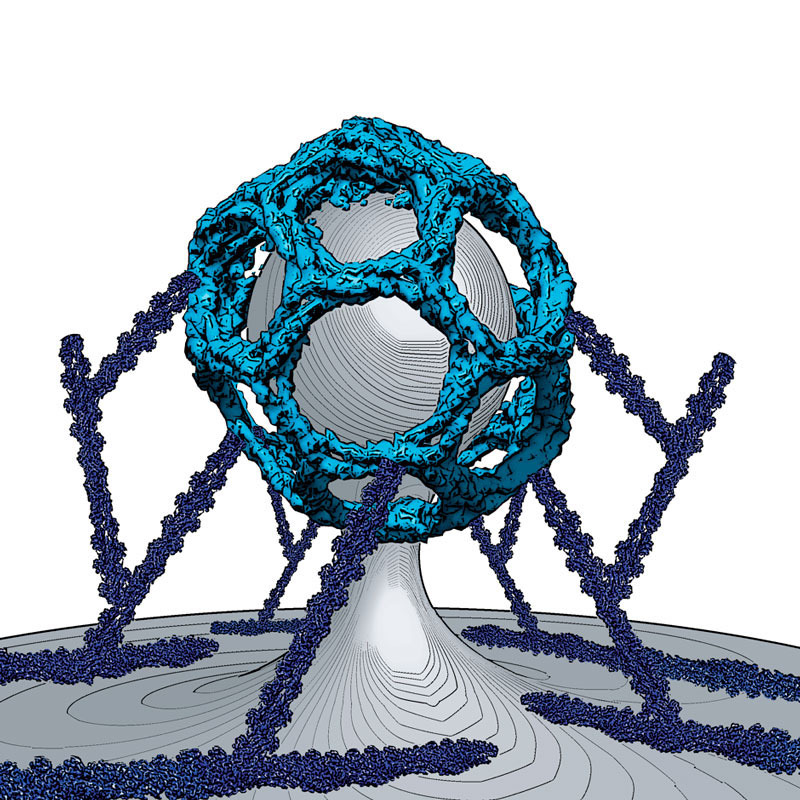 Overall, this work advances understanding of how the cell can spatiotemporally link the dynamics of the plasma membrane and the generation of an actin network during endocytosis. The process of endocytosis underlies the pathogenesis of multiple diseases. Many pathogens hijack the endocytic machinery to enter cells and some of the signalling alterations in cancers are caused by a failure of cells to properly regulate surface receptors via endocytosis. Moreover, the levels of FCHSD2 have been shown to predict the response of Acute Myeloid Leukemia patients to chemotherapeutic drugs. The molecular details elucidated by this new research may open avenues to develop drugs to fight infections and to design complementary therapeutic strategies for some types of cancers. This work was funded by the MRC and EMBO.